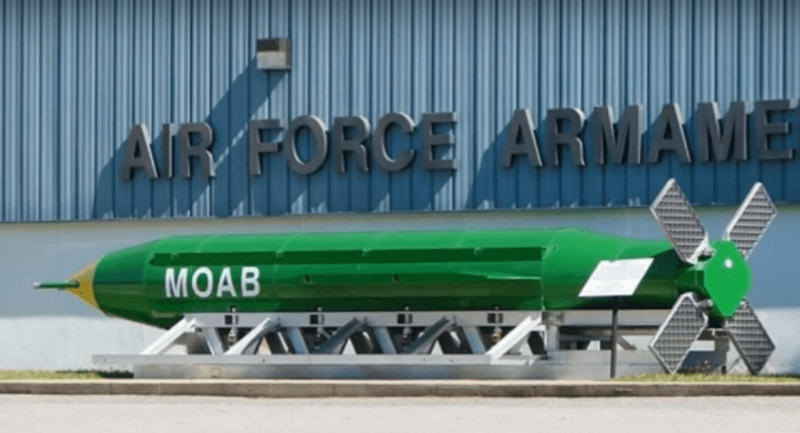 US Officials yesterday said that they have dropped Mother of All Bombs (MOAB) or GBU-43/B on Afghanistan to destroy IS tunnels and caves. The first ever use of this bomb came after tensions became high between North Korea and United States. Following the strike former Afghan president Hamid Karzai condemns the attack saying it was a weapons test, not war against terror as US says. This bomb was reportedly built in 2003. The bomb has been sitting in the warehouse for 13 long years. If you are on a brink of a war would you trust something this old? I don’t think so. To me it is obvious that the United States wanted to re-test this bomb in real world situation. A US aircraft career is right now on its way towards North Korea and President Trump said that US might have to deal with North Korea alone. Response from Pyongyang was they might use nuclear weapons if provoked even with a single bullet into its territory. Now, you see there is a need for United States to test not only GBU-43/B. My guess is that they have done far more tests without reveal much. The MOAB drop could just a piece of shred. Weighing about 10 tons means moving just one MOAB GBU-43/B is difficult. If you are in a battle front moving a huge bomb to your military field is not the only thing. Once moved you need to take care of it, you need to protect it from enemy attacks. After doing all that you certainly do not want to find it malfunctioning after dropping on enemy target. I believe this was the reason the United States tested the bomb. Going back to confrontation between US and North Korea, US most likely do not want to attack North with nuclear weapons. MOAB GBU-43/B being the most destructive bomb that is not nuclear this indicates US tested the bomb to use in North Korea. The war could start or not is another question. If there is a war the US would most certainly drop MOAB GBU-43/B on North Korea. North Korea has lot of mountainous areas similar to Afghanistan and the world does not know much about secretive regime of North Korea. In a situation like this, US would not want to under estimate the power of Kim Jong Un. There could be underground facilities, caves and tunnels far more advanced than Afghanistan. But, if US does not want use nuclear weapons the closest they can get to destroy such places is by using MOAB GBU-43/B. To set things straight, I do not believe MOAB GBU-43/B has anything to do with IS at all. Another factor of this bomb that is bothering me is its tail fins. US officials have said this is a GPS guided bomb which means the tail fins would have to be movable to maneuver towards its target. Looking at the picture it looks more like a fixed flat tail fain rather than something that could move to maneuver the bomb in flight. The video footage of a previous test of the bomb shows a parachute being used to pull out the bomb from aircraft. That means the plane that carries the bomb would not be able to release the bomb at a pin-pointed location which is another way it could strive with pin-point accuracy in absence of movable tail fin. But that theory does not seem practical. Design of tail fin indicates this bomb is very heavy. Otherwise a normal tail fin would deliver the bomb to maneuver towards its direction. A heavier bomb would have a more steep fall. Unlike usual bomb designs MOAB comes with two short wigs on the sides. Moving these wings could guide the bomb towards its target. Therefore, precision accuracy could be achieved. Visual signs from bombing video indicates the an area of about 500 metres being destroyed. If US wants to destroy caves and tunnels used by IS fighter I think US needs to drop at least 100 of these bombs to make an impact. I have never been to Afghanistan. But, who has not seen footage of Torah Borah? And many other areas of Afghanistan? Therefore, as President Karzai said this was no other than a weapons test in Afghanistan. Now I am wondering if people who died in the blast were infact IS members or civilians.